Recycling has become more and more prevalent in our society. It has also become more important to our ecology and economy. It not only reduces waste and pollution and overfilled landfills, it can also help keep things less cluttered around our homes. By looking around your home, you may have things that you don't need anymore, like old appliances - small and large. By recycling them, it doesn't just reduce things that are just lying around - sometimes you can get some extra cash if you take the time and make the effort to take them to a local recycling center or scrap yard that deals in metal. Although prices may vary based on demand, you can usually get a little bit. If you aren't interested in the extra effort to take things to the recycling center for the pocket money, many fire stations collect aluminium cans for burn units at the local hospitals. By setting up your own recycling center in your home, it can help reduce your own clutter. You can have bins lined with bags that can hold various recyclables, set up in your garage, basement or utility room. One can be for aluminum cans, another for plastic bottles, and another for paper. Any time someone sees something lying around, instead of just tossing it in the trash, or letting the junk mail pile up, they know they can take the things to bins. 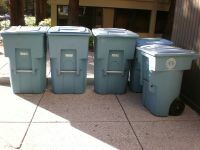 When the bins get full, you can either set them out for the city to pick up (if they provide a recycling program), or take them to the local center. Almost anything in your home can be recycled. There are e-mail groups that are dedicated to "recycling" or "freecycling" things around the house. The lists are organized by local regions. If someone has something they no longer need they can list it to the group and it is claimed on a first come, first served basis. If someone is interested in the item, they e-mail the person off the list and arrange for a pick-up time. The lists have been known to offer everything from coupons to large appliances. However, most lists do not allow pets to be included. These kinds of lists are great for people who just want to get rid of a few things and don't want to bother with a garage sale. If you start small and work your way up, before you know it, you'll be a recycling pro and have a much neater house for your efforts. Return from Recycling Organization to Home Organize It!